The internationally renowned clothing brand Mango opened its store at FASHION HOUSE Outlet Centre Moscow. Mango is one of the largest tenants within the outlet scheme, occupying a unit of 465 sqm. the urban and modern woman, meeting her daily needs. The brand follows the latest trends in its three lines: causal, suit-evening and sport-mngjeans. – We’re delighted to have Mango among our tenants. It is always our goal to provide the inhabitants of Moscow and not only with a shopping environment that’s friendly, welcoming and most of all filled with retailers that cater best to our customers’ needs – said Brendon O’Reilly, Managing Director of FASHION HOUSE Group. Mango joins an impressive tenant mix of famous Russian and international brands, including: Adidas, Reebok, Salomon/Wilson, Nike, Puma, Henderson, Lavazza, Shokoladnitsa, Le Creuset, Monsoon Outlet, Fabi, No One, Baldinini, Carlo Pazolini, Eсonika, Mascotte, Ralf Ringer, Tatuum, Kanzler, Tommy Hilfiger, Shele, Tom Tailor, Benetton, Albione, Yam Kee, Crazy Chicken, Respect, Solo Style, Enzo Brera, Geox, Tervolina, Yashma, Muz, Bronnitskiy Jewellery, Michelle Design, Elpida, Mr.Sumkin, Samsonite, Tru Trussardi, Ochnik, Giovane Gentile, Sbarro, 7camicie, Quiksilver, Reserved, Mohito, House, Cropp Town, US Polo, Waggon Paris, Lacoste, Calzedonia, Tezenis, Intimissimi, Incanto, Cacharel, Motivi, Elena Miro, Rubino Fiorella, Caractere, No One, Quicksilver and others. a foodcourt and children’s play area along with a parking lot for 1800 vehicles. 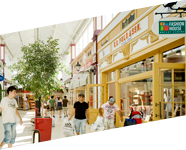 The size, location and tenant-mix make this outlet centre an important shopping destination. 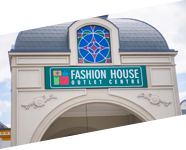 a valid building permit and leasing already underway, FASHION HOUSE Outlet Centre is set to welcome its first customers in 2015. 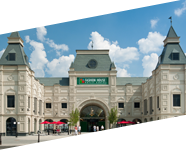 Over the last 10 years FASHION HOUSE Group has developed under the FASHION HOUSE Outlet Centre brand five successful schemes, located in Poland (Sosnowiec, Warsaw, Gdańsk), Romania (Bucharest) and Russia (Moscow). On a total lettable area of nearly 100,000 sqm, FASHION HOUSE Outlet Centres offer over 250 renowned domestic and international brands for 30-70% less than original prices, within buildings of a unique architectural theme. Every year over 10 million clients choose FASHION HOUSE Outlet Centres as a shopping destination. Co-forming the outlet market in Russia a few years ago was a pioneer move made by FASHION HOUSE Group. When the company started operations in the Moscow region, we were absolutely sure that we would achieve success. 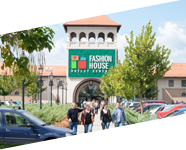 FASHION HOUSE Outlet Centre Bucharest registered in 2017 another year with strong performances, materialized in the best business results of the past seven years.